Quotes are easy to read and digest and they are powerful enough to get motivated quickly. If you are running a blog, online business or into marketing, you need inspiration. Like Zig Ziglar said, “People often say that motivation doesn’t last. Well, neither does bathing – that’s why we recommend it daily.” You need to get motivated EVERY single day to cope up with your work, relieve stress and boost your marketing skills. 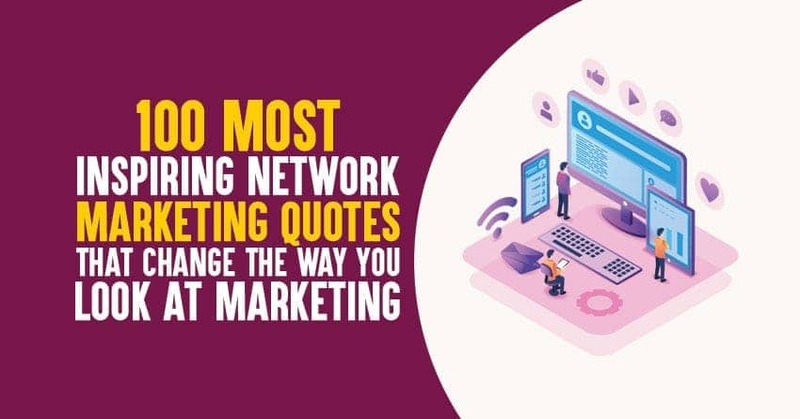 Here are 100 of the most inspirational network marketing quotes that help you succeed in business, making money and living a rich life. If you find a quote that inspires you almost instantly, make sure to create a wallpaper, stick it on your laptop and read it daily. Now, let’s get inspired. “Dream big by setting yourself seemingly impossible challenges. You will then have to catch up with them”. So what are your favorite network marketing quotes? Leave them in the comments. Please share or tweet the post so others can get inspired! Bookmark the post if you want to tweet these inspirational marketing quotes in the future. All quotes were inspired me thank you so much for sharing such good quotes. This list contains few of my favorite people whom I follow and admire way much. Thanks for sharing the list and the words they said which are priceless if followed. I admire Steve Jobs and Warren Buffet much more than others personally.